Tasters are employed at every stage in the wine industry to gauge, compare and evaluate the various blends. In the winery the owner or the cellar-master oversees the fermenting of the must and checks the vinification before maturing the wine or "raising" it as we say in French; an expression which perfectly expresses the idea of elevating the wine to its highest level of quality. Wholesalers, retailers and even ordinary wine-lovers are welcomed into the winery for pre-purchase tastings. Wholesalers' warehouses must be designed to ensure that the wine ages under the best conditions. Within these walls tasting serves the double purpose of guiding and checking. Other types of tasting are those required by law and as part of trade fairs. To complete the list of types of tasting, we should not forget the invitations issued to his customers by any wine-merchant eager to maintain his reputation... not to mention his commercial success. Things are very different where cigars are concerned. On the one hand there is a great difference between the worth of the wine and cigar markets. Part 4 of the present work is quite clear on this point. And on the other, cigar tasting has not yet been truly codified. Although the cigar-makers, who have built up a wealth of experience of their product, are good at ensuring consistency of taste and detecting any slight variations imposed by nature and the quality of the raw materials, the cigar-dealers are often lacking in this sort of experience. Few are willing or able to spend the time and money needed to make this sort of information available to their customers. But the chief problem is that cigar-tasting takes time and needs careful organising; this rules out the sort of free-for-all come and go, and particularly the sort of multiple tastings, typical of the wine trade. We will now compare wine- and cigar-tasting to highlight the origin and consequences of the fundamental differences between the two fields. 1. The wine-taster examines the wine's robe, noting its colour, transparency, depth and richness. 2. The wine-taster then smells the vapours given off by the wine and records a first series of olfactory sensations. 3. The wine-taster finally takes a mouthful; he gently swills it round his mouth and mixes it with air to release all the smell and taste of the wine. - All the wine is judged from a single mouthful. These three phases constitute the entire tasting session and can be repeated. 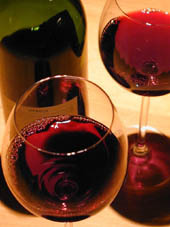 Provided the taster works under the same conditions, the same wine will be perceived in the same way. Once tasting is complete, the wine-taster will offend nobody by spitting out the wine to avoid the effects of the alcohol. Cigar smoke contains aromatic and taste constituents; it also contains substances that irritate but are diluted by the presence of water vapour (incidentally, one of the reasons for humidifying cigars). Then there is the nicotine which acts on the nervous system. 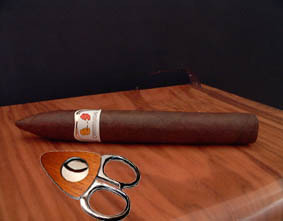 This side-effect creates a feeling of well-being that greatly increases the cigar-lover's pleasure. The effects of nicotine are not immediate but are certain to be felt. Another reason why cigar-tasting cannot be an instantaneous process. 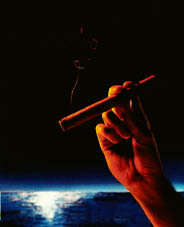 A cigar-taster will absorb nicotine through the walls of the mouth. There is no need to inhale; indeed it is a mistake to inhale as this can do nothing except irritate the bronchi. The absorption of nicotine causes a feeling of slight euphoria and continues throughout the tasting until a feeling of satisfaction is reached. Although this feeling depends on the quantity smoked, it also depends on the individual smoker. Once the smoker reaches this stage, the cigar is abandoned. Gilbert Belaubre: "Initiation to mastery"